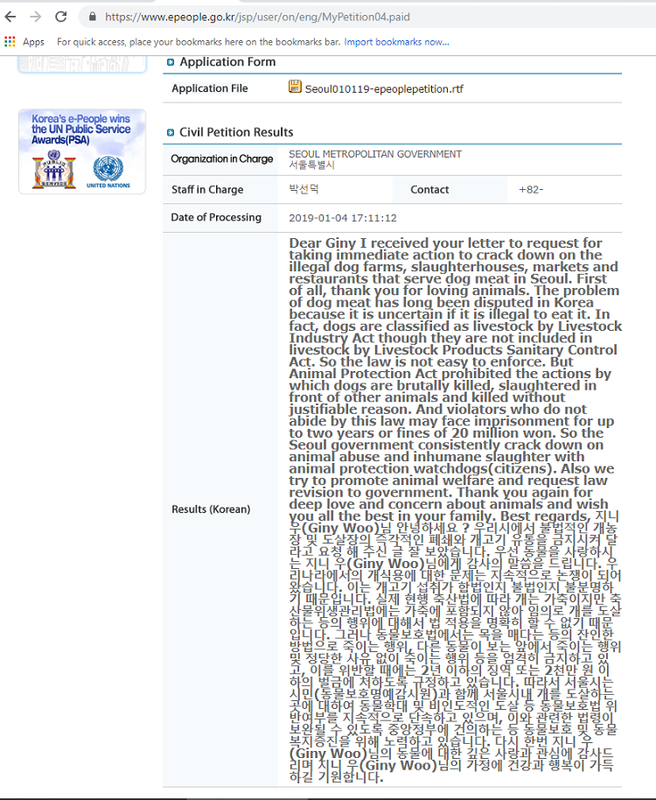 Following our epeople online petition Seoul, South Korea, Shut down the illegal dog meat farms, slaughterhouses and markets., we received from the Seoul Metropolitan Government the following predictable response, trying to assure us of their concern over animal welfare while at the same time waiving responsibility. They cited inconsistencies in their country’s laws as a reason for their failure to take action to close down their dog meat industry. But this is only an excuse. We have listed the illegality of South Korea’s dog meat industry to them, as documented by the Korea Animal Rights Advocates (KARA). The response received completely ignores this and highlights their government’s shameful indifference to the plight of these dogs. This country, one of the most industrialized and wealthy nations – home of Samsung, Hyundai, Kia, and LG Electronics – is lagging behind when it comes to animal welfare. They need to wake up to this fact, so let’s keep up the pressure by sending hundreds and thousands of these petitions. Click below to take action. 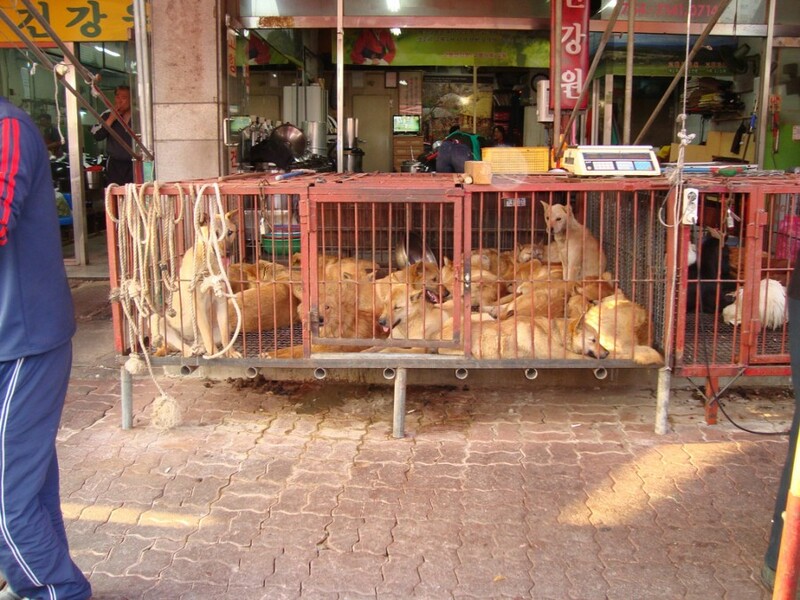 Stop the dog and cat consuption in S. korea !!! Complete and utter sadness overwhelms me when I consider the fate of these precious animals. In so many respects South Korea is such a modern country manufacturing many well known products, yet when it comes to animal welfare you really appear to have “”””lost the plot”” as it were. One might say the West is being hypocritical as they slaughter other animals for human consumption, I was raised to love and respect all animals hence do not eat any meat whatsoever. It is now imperative that Korea issues regulations stopping this dreadful slaughter of these lovely dogs- you lead the world in the automotive industry but unfortunately the same cannot be said when it comes to the slaughter and consumption of companion animals.We love our dogs and cats, as I sit here writing to you my two beautiful dogs are at my side, the mere thought of their being butchered in your country and then eaten horrifies me. In this year 2019 it is with my deepest hope you will gradually stop this oh so cruel practice- please consider. Thank you. Why GRADUALLY?!! Immediately works for me! Omg … they look like a family dog I had years ago . South Korea is ignorant barbaric & backward. It is up to them to change peoples views by ending this torture & killing of innocent animals. Prison for those who don’t comply. this dog meat cruelty must end! please help stop this now! Don’t buy any products from South Korea! Don’t buy any LG, KIA, Samsung, Hyundai and other products from South Korea. These savages will use your money to torture and kill dogs and cats. Could you imagine that people who have produced your car or TV, eat dog meat for lunch? Disgusting! I don’t eat any meat because of the suffering caused in rearing and then slaughtering animals. Deliberately inflicting pain, fear and suffering on any living creature is evil and unforgiveable. These people have no compassion and are beyond help. That’s why laws are made, to protect the vulnerable from evil perpetrators. You’ve got the laws, so implement them and stop making excuses. Together we will bring about change to these cruelties. Why though do governments hide instead of taking action ? Your country is meant to be one of the most modern in the whole world, yet your vile and disgusting treatment of animals puts you as one of the WORST alongside equally disgusting CHINA! I do not eat meat, however, if I did I would NEVER eat anything that had been abused and tortured the way your country does. You try to say that dogs and cats are classed as LIVESTOCK, does this mean that you ABUSE & TORTURE ALL of your livestock in the same way???? HOW DARE YOU consider yourselves as part of the human race, this requires HUMANITY which you clearly do not have. I PRAY TO GOD that there is KARMA and you and country get what you deserve!!!! Slaughtering, animal testing , entertainment through animals is not just beyond painful its also very unethical..
Future generation need to see all these natural heritage and beautiful natural forms on earth. Its urgent and high time we understood that we are not superior, all form of life on earth are interdependent. if humans are extinct the earth will flourish but the earth can never do without absence of other species..